Shopping for Pirates of the Caribbean Statues? Take a look at our huge selection of Pop! Vinyl Figures, Action Figures, Statues, Construction Toys, Key Chains, and Mini-Figures! How ‘bout a little kiss? Maybe next time? 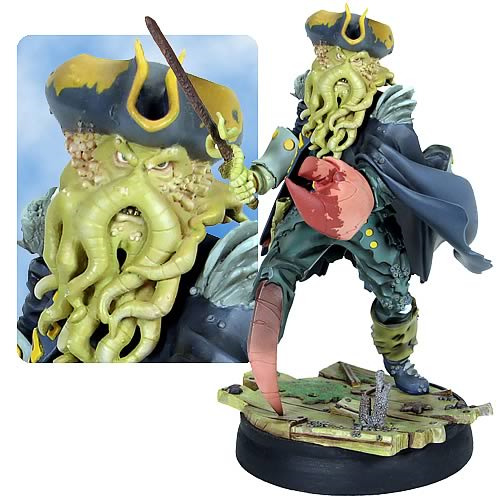 This scurvy pirate rules the seven seas and now he can rule your home! Disney and Gentle Giant teamed up to bring you highly stylized, animated versions of your favorite characters from the Pirates of the Caribbean films. With bright colors, fine detailing, and a distinctive look, this one-of-a-kind version of Davy Jones is sure to bring high-seas adventure into your collection. He stands 10-inches tall and comes with a hand-numbered certificate of authenticity and thematic base. Limited edition of 1,000 pieces. Swashbuckle that, matey!